While I was trying to figure out what was wrong, I ran into the same problem with a few other instances. After a lot of rounds of trial and error, the following changes finally did the trick. The items below collectively make up the solution and all items need to be performed in order to get the SQL server instance up-to speed again. Once the steps provided above are done, all the problems listed above should cease to exist. 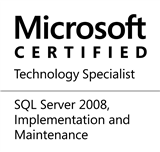 This entry was posted in #SQLServer and tagged #SQLServer, Administration, DBA, Guidance, Installation, Tips on March 13, 2017 by nakulvachhrajani.